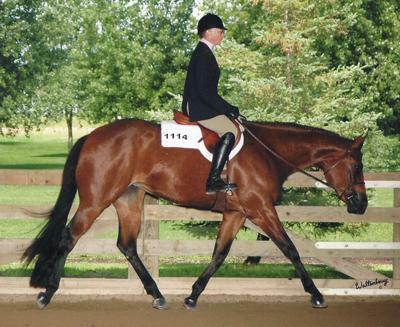 2011 Congress Green Western Pleasure - 4th; Absolutely Freaky (Absolute Investment x Zippos Advantage), 2007 gelding shown by Rusty Green of Pilot Point, Texas. 71 head shown in class. 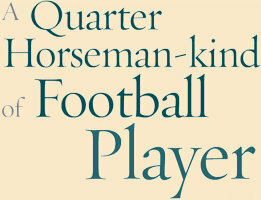 Doniphan, Nebraska: Dan McWhirter Quarter Horses has been recognized by the American Quarter Horse Association as a 2010 Leading Breeder in five categories, including top five in Performance Point Earners, Performance Class Winners and Performance Halter Class Winners. 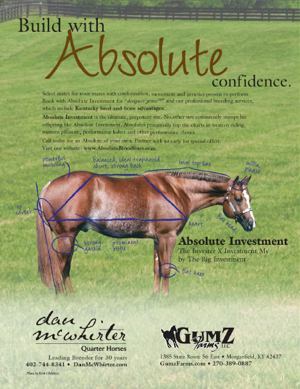 Click to view new ad from the Quarter Horse Journal. 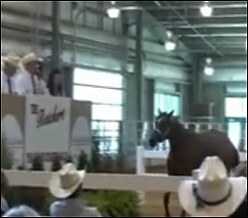 A gelding by Absolute Investment, 'Absolutely Yours' brought $25,500. An Absolute Asset daughter, 'You Are So Gone' brought $9,500. An Absolute Investment daughter, 'Absolute Good Karma' brought $14,500. CLICK HERE for a preview of our World Show Sale entries! Select your next Absolute winner from our inventory of prospects. From Western Riding to Performance Halter, we have an excellent inventory of started prospects, as well as Kentucky-bred prospects. 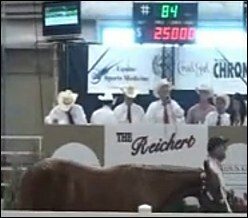 Absolutes prove themselves in the show pen. They have great minds, balance and conformation that make them trainable and more predictable. Browse our inventory and pick your next winner today! 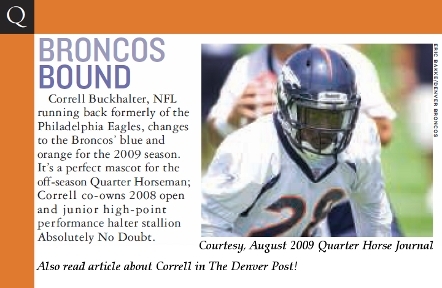 NFL running back Correll Buckhalter is proud of his roan Quarter Horse stallion. 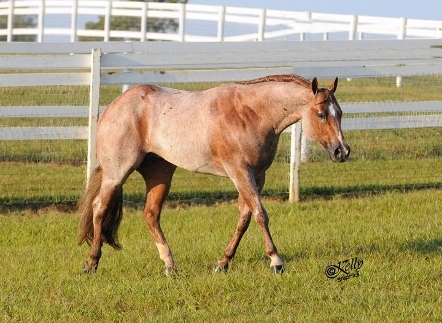 Absolutely No Doubt, 2008 AQHA High Point Performance Halter Stallion is both the Open and Junior Divisions, is co-owned with Correll Buckhalter and Dan McWhirter. Absolute Preference, shown by Leonard Berryhill of Talala OK, is a full sister to 2008 Honor Roll Performance Halter Stallion Absolutely No Doubt; they are both sired by Absolute Investment. Good To Be Invested, sired by Absolute Asset, won the Nebraska Breeders Yearling Longe Line. 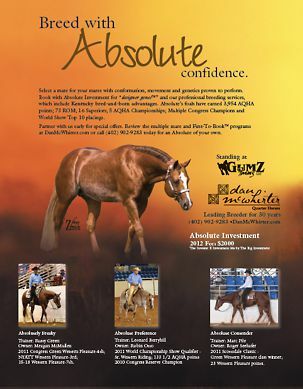 Click to view full page ad from the AQHA Journal. View Kim's World Show images here.